Cooking with Joey: Thanksgiving Rescue 911! 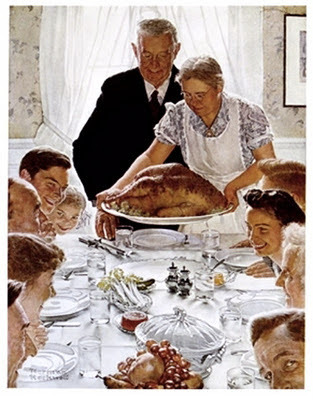 I've always loved this famous Norman Rockwell painting. It's clearly the image of what we all perceive as being the perfect Thanksgiving. But what do you do when some of your dishes don't turn out?? We've all heard the horror stories about kitchen disasters on Thanksgiving, right? The turkey is still frozen, the side dishes aren't hot enough, the pumpkin pie is cracked, the gravy is lumpy, the mashed potatoes are gluey, and on and on. Let's face it... things don't always go as planned! The most important thing to do is to relax and don't panic! Everything will be fine! I know you want everything to be perfect, but no one will judge you if you have to resort to a plan B. We can all use a little help every now and then, so here are a few quick fixes for Thanksgiving's most common dilemmas. 1. The turkey is still frozen. It takes a long time to thaw a turkey in the fridge -- about 5 hours per pound. To speed up the process safely, you can defrost the turkey in cold water, which is a lot faster. Simply put the turkey (still in its wrapper) in your kitchen sink and cover it with cold tap water. Every half hour, drain the water and refill the sink. The turkey will thaw at a rate of about 30 minutes per pound. Meanwhile, call your guests to tell them that dinner will be delayed, and have some extra hors d'oeuvres on hand. And don’t forget to remove the giblets after the bird is thawed. If you're way past the point of thawing the turkey in time to cook it for dinner, put the frozen turkey back in the freezer and go to the store and buy a fresh one. Oh, and remember, it’s never a good idea to thaw the turkey on the counter overnight. 2. The turkey is dry. Preventive measures are the best way to address this potential problem: brining the turkey, or using an oven-roasting bag, or tenting the turkey with foil while it cooks. If it's dry anyway, that's what gravy is for. 3. The turkey is cooked, but the stuffing hasn't reached 165°F. This one's an easy fix. Just scoop all the stuffing out of the turkey and place it in a casserole dish. Place it back in the oven, uncovered, and let it finish cooking. To avoid this in the future, stuff the turkey with aromatics like onions and celery and fresh herbs, and leave the stuffing in its own dish. You get the bonus of a nice crispy top! Btw, if the stuffing comes out too dry, just drizzle with a little chicken broth, dot with butter, cover, and then pop it back into the oven to quickly reheat. 4. You only have a small oven, and you're not sure how to manage cooking a turkey plus all the side dishes while keeping everything hot. The key to this dilemma is all in the planning. The best thing to do is to make as many things as you can in advance. Have a quick look at my previous article about Thanksgiving Planning. And when all else fails, be sure to have plenty of hot gravy in a pot on the stove. It's the easiest way to warm up your turkey or stuffing or mashed potatoes. 5. The pan drippings have burned, and now there are no browned bits left for making gravy. Yes, you can still make gravy. Just cut a couple tablespoons worth of nicely browned bits of skin and meat from the underside of the turkey, chop finely, and in a clean skillet, sauté them in bacon fat or butter with minced onion and fresh herbs such as parsley, thyme, and sage. When the aromatics are well browned and soft, sprinkle flour into the pan and cook the roux until golden; slowly add your broth, and cook, stirring, until the gravy is as thick as you like. This one's a little tricky. Depending on how much you've oversalted, you may not be able to salvage the dish. I've heard of adding something acidic, like lemon juice or wine or vinegar, but it really doesn't fix the situation. It just tricks your taste buds into tasting acid instead of salt. You can try adding more of the other ingredients, which will balance everything out, but that's not always possible. The best thing to do is to make sure you go easy on the salt in the first place. If it's an easy recipe and you have the ingredients on hand, the obvious solution is to just start over. And use Kosher salt instead of iodized table salt. I find that even when you use a little too much, Kosher salt wont make the dish taste too salty the way that iodized salt does. It'll just make the flavor of the dish more intense, which is a much better trade. Oh, and never believe anyone who tells you that an extra added potato will absorb the extra salt. That never works. 7. The vegetables are overcooked. 8. The gravy is lumpy. Those little white lumps in the gravy are just clumps of undissolved starch. Simply pour the gravy though a sieve and serve. If it's not thick enough, you can put it back on the stove and let it reduce until it reaches the desired thickness. You can also thicken it quickly by adding cornstarch or flour to some COOL water until it's dissolved, then adding it to the gravy. It'll quickly thicken as it comes up to heat. If your gravy is too thick, simply thin it down with a bit of chicken broth or wine, or even just a bit of water. If you add wine, be sure to simmer it for 5-10 minutes. 9. The mashed potatoes are gluey or lumpy. This is another one of those problems that's hard to fix once things have gone south. The thing that makes the potatoes gluey is over mixing. I've also heard that adding milk or cream to the potatoes before you mash the potatoes will make it impossible to get out all the lumps. Solution for both problems: Instead of using a hand masher which leaves lumps, or an electric mixer which makes glue, try using a food mill or a potato ricer. You won't have any lumps and your potatoes will be smooth and satiny. If your potatoes are already like spackle, spread them into a shallow baking dish. Top with buttered bread crumbs or even Parmesan cheese, then bake in the oven until golden on top. The crunchy gratin topping will help disguise the consistency of the potatoes. If your potatoes already have lumps in them, just declare them as being "rustic", as if you had planned it that way. Never apologize!! I once heard of someone asking what do to after she dropped the pumpkin pie. Lordy! That could be a mess! If that ever happens, see if you can salvage any of it, then spoon it into decorative glasses , layered with whipped cream. Top with a sprinkle of ground cinnamon or some chopped pecans. If your pecan or apple pie is a little soupy after you've baked it, you can either put it back in the oven and see if that'll help it to set up, or you can spoon some of the pie filling over a dish of ice cream. Soupy pie fillings make excellent ice cream toppings! If your pumpkin pie has a huge crack down the center of it, don't fret! If this is the worst thing to happen, then you're way ahead of the game. I doubt anyone will really care, because it'll still taste delish! But if you still want everything to be perfect, all you need to do is pipe some whipped cream on top of the pie to hide the San Andreas Fault. No one will ever know the difference! You can also keep the cracked pie in the kitchen, then cut it into slices and place each slice on a dessert plate, topped with some whipped topping. Then serve the individual servings to your guests when it's time for dessert. Of course, we never expect things to go wrong, but it's always nice to have a little back up plan, just in case! Be sure to have lots of extra butter, cans of chicken broth and jars of gravy on hand. I've heard of these items as being "the duct tape of Thanksgiving", which cracks me up. It's also not a bad idea to have extra cream, bread crumbs, and some fresh herbs on hand. They'll fix a multitude of sins. Garnish your dishes, present your meal with a flourish, and whatever you do, DON'T APOLOGIZE FOR ANYTHING! You're guests will love everything because YOU cooked it for them! Thanks for the pearls of wisdom! Great tips and reminders! I feel well prepared. Gravy! Always gravy. Hmm. Pearled onions… Any thoughts?